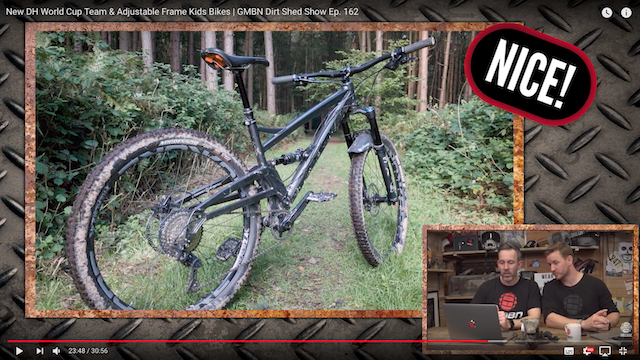 In the GMBN Bike Vault Again! After getting my old bike (and Owen) into the GMBN Bike Vault last year, one of my goals for 2018 was to get my Orange Four into the Bike Vault – and I’ve finally managed to do it! Each week the presenters ask for people to send in their bikes, and they have hundreds of entries, I try each week, hoping that my bike will be featured. I wasn’t holding out hope this week, as it wasn’t one of the better pictures I had submitted – but I woke up to a message from a friend saying that they’d seen my bike. So when I sat down with Owen, to watch the Dirt Shed Show, which is our usual Saturday morning ritual, the question on my mind was “Nice” or “Super Nice”? The entry prior to mine were genuinely “Super Nice” both in terms of bike and photograph, so I wasn’t too disappointed with just a “Nice”. I’ve embedded the full episode at the bottom of this post, or click here to go straight to my bike at 23m24s. One of my goals for 2018 was to improve my bike handling skills, and today I took a big step in the right direction by going on the Chase Skills “Skills ‘n’ Thrills” course at Cannock Chase. It has been over three years since I started riding and other than a few bits of advice from friends and GMBN videos on YouTube, I haven’t had any coaching. I know I’m not the best rider out there, but really wanted to make sure I hadn’t picked up any bad habits and hoped I could pick up some new skills too! After a short ride to warm up, we dropped down “High Voltage” so that Alex, the coach, could get an idea of our riding styles. His (very fair) assessment was that I seem to either be pedalling, or in the attack pose and that I seem still on the bike. After climbing back up “Zig Zag” we did some drills on a fire road, finessing our attack position by rolling over logs. I found it difficult to focus on individual skills at this point, as I had to fight years of muscle memory. The next skill we worked on was manuals (lifting up the front wheel), something I have been trying to do unsuccessfully for a few years. However after Alex explained the technique I shocked myself by doing a good manual first time! After a few more manuals we moved on to rear wheel lifts, not something I had ever tried before, but seemed to get the hang of fairly quickly – I particularly liked the challenge to ride along next to a puddle, then hop the rear wheel into it. The next step is to link these together into a bunny hop, I didn’t get onto this, but am considering it as homework. I actually enjoyed doing the skills drill on the fire road, and was already thinking how I could set up something similar on the track behind my garage. After the drills we took a combination of the Follow The Dog trail and some off piste sections to the cafe at the main car park for some lunch. One of the off piste sections was the second part of the Leisure Lakes demo loop, which I have blogged about previously, but in reverse. Even going downhill it was still hard work with the mud and roots. The final blast down down the steep hill was fun and I could already feel the drills from the morning helping. After a well deserved lunch, we set off back on the main trail to work on cornering technique. We stopped at the first main berm on Follow The Dog and sessioned that for a while, working on leaning the bike over. I distinctly remember using this technique on some fast berms at Llandegla the other week, but struggled to break it down, especially at walking pace. On my last go through the corner I really felt like I got it on the second half of the corner when I really pushed the bike over. Certainly something that I need to practice more! As we were on the main trail it was interesting seeing everyone coming past and how they were riding the corner, everyone was braking in the corner then pedalling out – it looked like they were exiting the corner slower than we were after entering the corner at walking pace! We then rode to the end of the Twist And Shout section to practice our new-found skills, which is easier said than done when the corners come so fast after each other. Back on the fire road we rode to a section next to the the blue trail where we could practice going up and down some short and sharp technical slopes. Some of the ones we were shown looked impossible to walk up, let alone ride up. Fortunately we didn’t have to ride those, we went to a mellower section nearby. I was quite pleased to be the only one to ride the up-down-up challenge that we’d been set, but didn’t like the look of the drop off into a steep rooty chute. The drop off was probably only about a foot high, with a further ten feet down the chute, but my brain just said no! I would have been fine riding either the drop of the chute in isolation, but really felt like I needed to work up to it. Fortunately the rest of the group felt the same, so we moved on to another drop with a smaller and smoother run out. I rode this one fine, although I did bottle it when it came to pulling a manual off it – I think I’ll start with much smaller drops, such as kerbs, first. At this point I realised we were at the bottom of Cardiac Hill, my former nemesis. Usually this is attacked towards the start of a ride and here we were after a full day in the saddle. I surprised myself by riding up it, I felt like I was going really slowly, but Strava gave me a Personal Record for it, so I’ll take that. I also didn’t feel as tired as usual at the top, I don’t know if it was down to being at the end of the day, or that I was riding with a group. I’ll have to see how I fare next time! We took a gentle ride back to the cars, practicing our new found skills. After the ride I was talking cars in the car park with Alex, more specifically my MR2 and relating some of the points from the course to how I drive it. On the way home I realised that without knowing how I drive my MR2 Alex had hit the nail on the head for me – the MR2 isn’t a powerful car, but I can drive it fast because I have the confidence in the tyres and handling to carry speed through corners, often surprising drivers of supposedly faster cars. When I’m driving the MR2 I feel at one with it – I need to get to that point on my bike, and after the coaching I feel like I have a lot of the tools I need to get there. Monday Service? You may be thinking that it is usually a Sunday Service… The reason for the Monday Service is that there was a Sunday Service scheduled in March, but snowpocalypse happened and it was moved to Easter Monday instead. Unfortunately, despite it now being April, the weather wasn’t that much better, with a lot of the country under snow and suffering from general traffic chaos. It wasn’t that bad in the Midlands, it was just very wet. So, much like last year, I led a convoy of cars down a very wet motorway to Silverstone and drove carefully around a wet track. What was different is that the circuit had been resurfaced, so there was less standing water, with the exception of Brooklands corner, which was very wet. Given the conditions I was taking things easy – I would rather be slow than in the gravel trap/pit wall. I still had fun and even managed to do some overtaking, albeit only a replica A-Team van! There was a red flag towards the end of the session, after a Caterham had got stuck in the gravel trap. I was first back into the pits and lined up ready to go out again, but everyone else, bar two other cars, decided to call it a day. So when the track re-opened there were only three of us out! The clip above is from one of these laps – as you can see I had no traffic. Perfect! I’d met my Dad and his friend Mark, for breakfast before going out on track. I then convoyed back to Chipping Norton with Dad, where Jen, Owen and my Mum were waiting for us. We spent a lovely afternoon all together, followed by possibly the best meal I have ever had – Mum’s roast gammon with corn in cheese sauce and Jen’s Creme Egg brownies with ice cream. By this point the weather had improved enough to drive home with the roof down. A great end to a bank holiday!